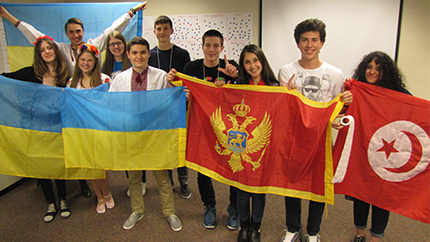 Dina (third from right) poses with the flag of Montenegro during an activity at her host school. Dina, an American Councils-placed American Serbia and Montenegro Youth Leadership Exchange (A-SMYLE) student from Montenegro, is a positive influence in her host community. Dina is an “A” honor student and a photographer for the yearbook staff at school events. She also participates in the school choir, drama, and debate clubs. Dina has taken the initiative to make her exchange experience a success. To find volunteer opportunities in her host community, she first sat down and researched activities as well as organizations that interest her. Dina currently has 50 community service hours. She volunteered to work as an usher for a theatrical production, cleaned playground equipment, and helped to feed homeless residents. Her goal is to complete over 100 hours of community service.